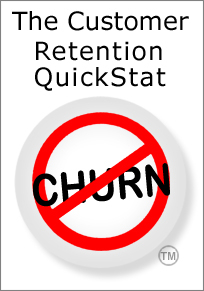 A common question keeps coming up in my conversations with SaaS/Cloud CxO’s all across the industry: “How many Customer Success Managers does it take to keep customers from churning?” The question appears in other forms, such as “how much CMRR (Contracted Monthly Recurring Revenue) should each CSM be responsible for?” Or, “How many customer accounts can a CSM handle?” Staffing level is a near universal challenge in the CSM profession. But before staffing can be authentically evaluated for any company or the industry in general, there are two necessary prerequisites that must be established. The CSM role has to be consistently defined within the company, and you have to have the process data upon which to base the necessary calculations. The typical starting point for a CSM team is where one or more people find themselves assigned to a “fire-fighting” group and told that their role is to save at-risk customers. Oh, and by the way, do what you can to spot potential losses in advance and see if you can head them off before they make it to the door, would you? The result is a constantly shifting job description where change is the order of the day. In the LinkedIn CSM Forum, a CSM exec recently noted that one of the biggest challenges he was facing is “trying to figure out a reasonable threshold of effort for each of our different customer profiles based on our current and short term staffing” … “but it’s difficult because the role can be so open-ended given its broad mandate.” That CSM exec is far from being alone in the struggle; I hear similar comments every day. Some degree of change in the strategy and process of the role is to be expected as both the company and the team move up the Customer Success Management Maturity Matrix, but at each level, there needs to be enough consistency to allow for reasonably accurate calculations. If you’re at the fire-fighting level, and you know how many customers are nearing the renewal point (and may be considered as being at-risk) and have an in-the-ballpark idea of how much effort will be required per such customer, you then can make some educated guesses as to required staffing. You can also prioritize based on the dollar value of the at-risk relationships. Keep in mind, though, that the old folk saying about a stitch in time saving nine has a great deal of truth in it. The closer to the exit door you let a customer get, the harder and more expensive it is to keep them from walking through it. Evaluating staffing levels is essentially a calculation of task, duration, volume, time distribution, skill-set and utilization factors. 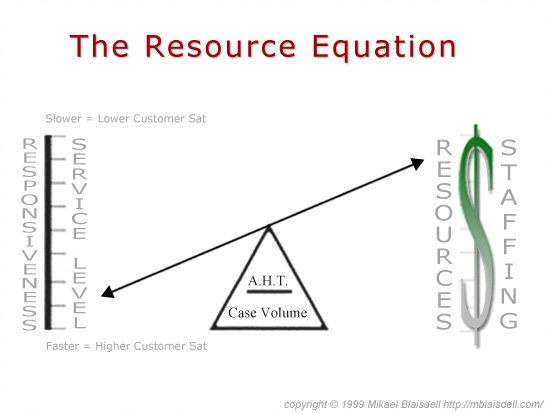 Every operational assessment I’ve done over the years includes this issue, and I use The Resource Equation graphic to illustrate the key factors for Senior Mgmt. For Customer Support teams, I check their case management system to determine issue categories, volumes and durations. I then review the access management tools (phone switch reports, email handlers, etc.) to get the historical pattern of when interactions occur and verify durations. The knowledge base system can give me some indication of how much training and content-development time is involved in keeping the team’s knowledge inventory up to date. The last step is to ask Senior Management: how fast do you want the response level to be? The resulting data can produce a reliable answer: If you want 95% of all incoming interaction requests to be engaged within 30 seconds, then your staff has to be X members. Can’t afford that many? Then you can’t have that level of responsiveness under the current operational realities. You either have to accept a slower response level (and risk alienation of customers) or you have to somehow make Y% of those interaction requests go away. Currently, we don’t have the analytics and data foundation to do that calculation as easily with CSM. We just don’t know -yet- which activities have what level of effect on retention. To build it, we’re going to have to add even more work to our CSM team — not only will they have to keep the customer steadily moving up the adoption curve and away from the exit/churn door, they’ll also have to keep detailed notes as to what they did and how long it took to do it. Or, which I think would be smarter, the team needs to use tools that keep track of interactions and have somebody observing, documenting and analyzing the results. Process observation & analysis is a part of my assessment procedure for CSM groups, but the teams need to be doing it themselves so that they develop a body of knowledge about which interactions are the most effective and which access channels are best for which categories & outcomes. “The closer to the exit door you let a customer get, the harder and more expensive it is to keep them from walking through it.” The staffing level question isn’t going to go away just because it’s tough to answer. There will always be belt-tightening budget cutters on the prowl. At a recent CSM Forum gathering in San Francisco, Dan Steinman, CCO for JBara Software, recalled telling a senior management team in a previous job that “We don’t talk to satisfied customers.” Explaining that the team just didn’t have the resources to do anything beyond their basic fire-fighting mission, he said that if they wanted to expand the CSM role, then they’d have to authorize the additional headcount to accomplish it. Fortunately, he was able to persuade them to see the realities, but empirical arguments may not always be enough to carry the point. You need to have hard proof — the verifiable data and the calculations, and how they relate to retention and per-customer profitability optimization — to defend your staffing and technology budget. If you need some assistance in developing that proof, give me a call.